What is website personalisation and why do you need it? We’ve all bought something from Amazon, haven’t we? Amazon’s incredible success is thanks (largely) to one factor: personalisation. Some years ago, they pioneered personalised recommendations, meaning visitors could easily find items matching their interests. The results? More engaged shoppers who bought more. Those recommendations now account for an enormous 30% of Amazon’s revenue today. So what exactly is web personalisation? 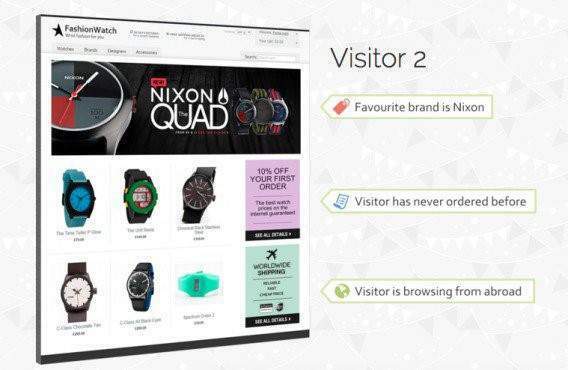 Personalisation means segmenting and understanding the uniqueness of each visitor based on real time data. It means taking into account not only demographics such as gender, age and location, but also browsing patterns, behaviour and intent. It means learning what a user wants and needs at each given moment and adapting your site in real time. Below is a simple example of how a site’s homepage can be personalised. Visitor 1 is female from the USA, browsing in summer time. Using the data collected, the website adapts its content by showing a woman in the banner image, featuring women’s watches, displaying summertime deals and assuring her of free shipping within the US. Visitor 2, on the other hand, is a man from the UK. It’s his first visit to the site, so he is being offered a first time purchase incentive. He is shopping from abroad so is being assured that the site ships worldwide. However in both these scenarios, things could change fast. Visitor 1 may decide she wants to buy a gift for her male friend, and content must adapt in real time. Visitor 2 may be ready to abandon the site and so a personalised incentive could be used to persuade him to continue shopping. The inevitable shift to online shopping has necessitated this personalised approach. There was a time until relatively recently, where shopping online meant quite the opposite: a one size fits all approach. Every visitor saw the same landing pages, and were left alone to navigate through the site unaided. This impersonal shopping experience lacked the engaging human interaction found in a physical store. Personalisation is now being delivered throughout the web. Whether it’s choosing a film on Netflix, browsing your Facebook feed or searching for a product on Amazon, personalised experiences are being served at every turn. Why do you need personalisation in your store? Last of all, the results speak for themselves. Personalised sites see: increased conversion rates, increased revenue, lower bounce rates, higher levels of customer engagement and improved customer retention. When it comes to marketing, this truly is the time to get personal. Ben Prince works at Bunting, experts in personalizsation for growing businesses.